Your songbirds will have it "made in the shade" with this happy haven! Makes a spectacular presence in your bird sanctuary! 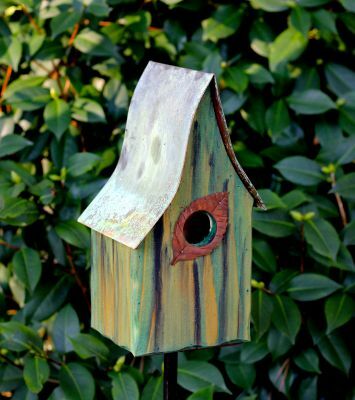 The Shady Shed Bird House is beautifully designed with cypress sides and copper verdigris roof, Shady Shed is also carefully constructed, hand painted and distressed for an elegantly aged look. Add in a copper leaf/predator guard, and all together it's the kind of care your songbirds deserve and need. Open your heart, open a door!